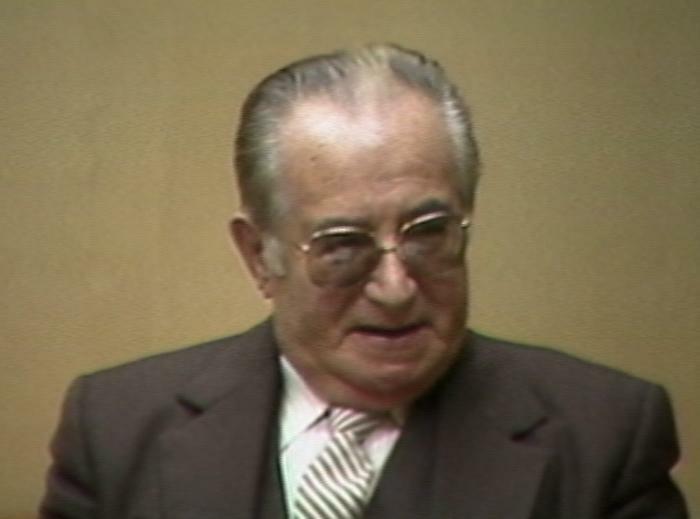 Still image from Berl G. Holocaust testimony, November 16, 1983. SynopsisBerl G. was born in Vilkija, Lithuania on January 5, 1919. He describes his family. They moved to Kaunas, Lithuania and Berl recalls the Jewish community. He describes the Russian occupation. He describes the German invasion in 1941. He describes the forts surrounding the city and how they were used as jails. He describes being forced into the ghetto and forced labour at the airport. He recalls separation from his family and mass killings in the Ninth Fort. Berl describes his participation in the Kaunas ghetto resistance movement. He describes being sent to the Ninth Fort. He describes his escape attempt with other resistance members. He recalls his capture, imprisonment, and torture. He describes forced labour exhuming mass graves and burning of corpses in detail. He describes his escape attempt with other Jewish prisoners and POWs. He describes returning and hiding in the ghetto. Berl describes leaving the ghetto to join a group of partisans. He describes the group of partisans and their activities. Berl speaks about his brother’s involvement with the partisan group, his brother’s death, and Berl’s involvement in the execution of the man who killed his brother. He describes meeting his wife during this time. Berl describes Russian liberation. He describes coming to Canada. He discusses sharing his experience. Berl shows photographs.